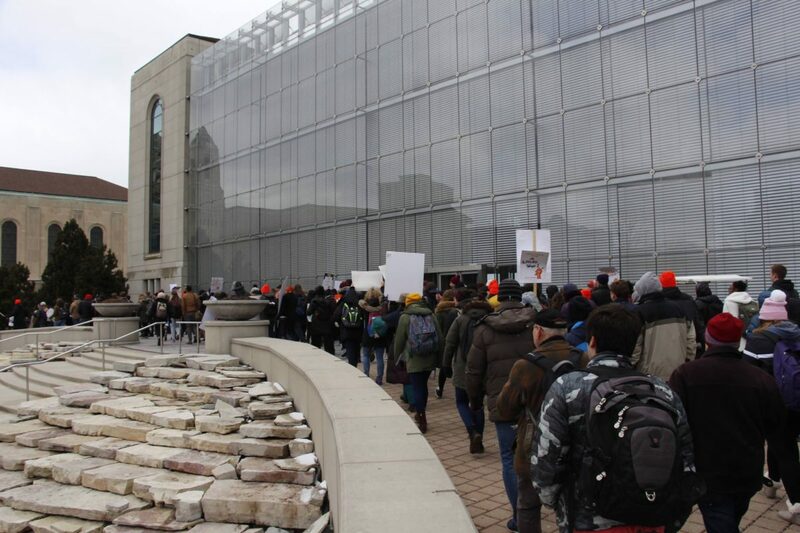 Almudena Rincón | The PHOENIX Demonstrators filled Loyola’s Lake Shore Campus April 4 to protest what they said was the university’s slow negotiation as non-tenure track faculty in the College of Arts and Sciences attempted to work out a deal with administrators. Loyola’s non-tenure track (NTT) faculty union reached a tentative agreement with the university Monday night, but the graduate student union — which includes teaching and research assistants from the College of Arts and Sciences — hasn’t received the same opportunity to negotiate with the university. Formed in February 2017, the graduate student union hasn’t been recognized as a union by Loyola, despite its recognition by the National Labor Relations Board (NLRB). In October, Loyola officials said they wouldn’t proceed with negotiations with the union, and The Phoenix has reported graduate students are prohibited from holding other jobs while working for the university. Graduate assistants are paid a stipend from the university and can work up to 20 hours per week. They are also subject to the university’s Teaching Assistantship Guidelines. Responsibilities include grading papers, holding office hours and teaching classes, among other things. University Communications Specialist Evangeline Politis said in an email to The PHOENIX the university won’t recognize graduate students as employees because they don’t fall under the definition of “employee” by the National Labor Relations Act (NLRA). According to the NLRA, an official “employee” can’t work for an organization which isn’t considered an employer by the NLRA defininition. The statement also said Loyola values its relationship with graduate students, but a union isn’t the best choice. “Consistent with Catholic Social Teaching, it is just and acceptable to recognize the important relationship Loyola has with our graduate assistants, address their needs, and give them a voice, but it need not be through a union,” the statement said. Even though the graduate student union hasn’t been recognized by the university like the NTT faculty union has, it supports the NTT cause, according to union member Alec Stubbs, a second-year doctorate student in the philosophy department. “The entire idea is to sort of build the coalition, to be able to actualize the ideals that we want to see at the university,” Stubbs said. Stubbs said organizers want higher wages for graduate student workers and union recognition from the university so they can bargain for more benefits. Stubbs said the graduate student union still intends to negotiate with the university, but a contract for NTT faculty takes priority. He also said seeing the NTT faculty negotiate with the university has shown negotiations won’t be easy. Alyson Paige Warren, an organizer for the NTT faculty union, said the university denied to recognize them as a union twice because of the university’s Jesuit identity. The NLRB overrode Loyola, saying faculty were primarily educators, not religious workers. “It’s frustrating, seeing the non-tenure track faculty bargain, because we know that if we are ever to make it to the table, we’re going to have to hold them to account,” Stubbs said. Loyola graduate students aren’t alone in their frustrations. Graduate students at Georgetown University — another Jesuit institution — were recognized as a union this month after being denied in December, according to the university website. Graduate students at the University of Illinois at Urbana-Champaign reached a tentative contract agreement in March after negotiating and going on strike. “I think the graduate students and the NTTs and the students as a whole all fit in together under this aspect of Loyola needing to listen to the very people that make it as great as it is,” Warren said. The NTT faculty union reached an agreement with the university Monday night. Warren said the union will be in a better position to support graduate students after reaching an agreement. “We understand that we’re in a different position than them in the fact that Loyola has been forced to recognize our union and continues to … ignore theirs and so we would definitely shift our energies and our focus to make sure that they were able to win a fair contract,” Warren said. 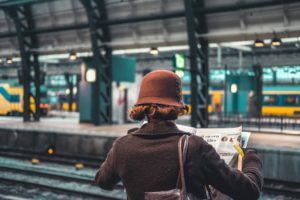 According to the NLRB website, employers can’t restrain employees from unionizing or otherwise organizing, but there aren’t legal repercussions for refusing to recognize a union. The graduate student union has been discussing the addition of dental benefits for graduate student workers. Stubbs said representatives from the union met with the dean of the graduate school, the Rev. Thomas J. Regan, S.J., about a month ago to discuss dental benefits. Currently, graduate students have a health care plan — which doesn’t include dental coverage — available, but Stubbs said the cost is almost $3,000. In an email to The Phoenix, Regan said he and Margaret Callahan, the provost, and John Campbell, the bursar, researched the issue of dental care extensively and came to an agreement to provide dental benefits for graduate student workers. He said the university is working with health care providers to find a solution.